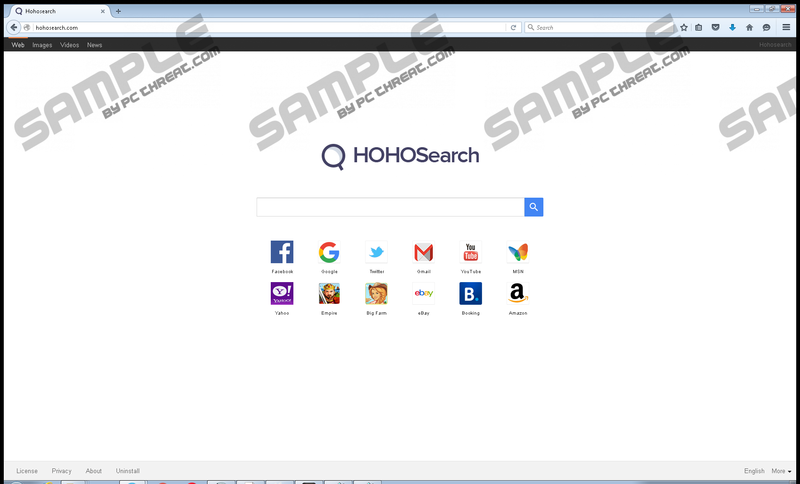 Hohosearch is a browser hijacker that will replace your homepage on Mozilla Firefox and, probably, Google Chrome. It has been found that this infection is the most prevalent in India; however, you cannot feel safe if you live in a different country too because this threat quickly spreads through the web. It has been noticed that this infection travels in software bundles with free applications, which means that users who often download freeware are in danger. If it happens that you notice that your default homepage has really been replaced by Hohosearch (hohosearch.com), you need to eliminate it immediately despite the fact that it does not look like a dangerous search tool. Unfortunately, there is a bunch of users who decide to keep Hohosearch just because it looks good. Believe us; the appearance of the program or, in this case, search engine does not say anything about its trustworthiness. Specialists at pcthreat.com do not consider Hohosearch a reliable search engine because it is very similar to hijackers from the ELEXA family, e.g. searchatomic.com, yessearches.com, and mystartsearch.com. On top of that, research has shown that this search engine shows the modified search results. Even though you will see the search results provided by the Google search engine after entering the keyword into the search box, these search results will not be trustworthy because it is known that they will contain commercials and sponsored third-party links that could lead to untrustworthy sites. This is definitely not the only reason we suggest getting rid of Hohosearch completely. Specialists have conducted research and confidently say that the Hohosearch browser hijacker might also gather information about users and their activities. Unfortunately, it is very likely that personal details will be recorded too, which means that your privacy might be violated if you do not remove Hohosearch. Hohosearch is a unique browser hijacker in a sense that it not only changes the settings of browsers, but also creates a new Mozilla Firefox profile and loads it every time a user opens the browser. To be more specific, it creates the new profile in %APPDATA%\Profiles. What’s more, it has been found that this browser hijacker might install extensions on Google Chrome in order to set itself on this browser. Do not worry; you can fix everything easily. You simply need to remove Hohosearch from your system completely. We are sure that Hohosearch does not have an official website, and users cannot download it willingly; however, it finds other ways to sneak onto computers, for example, it is known that this browser hijacker comes in software bundles together with freeware and shareware mainly. In addition, it might be installed on your computer if you click on a bad link or advertisement. Last but not least, you might get it instead of a “useful” program from a file-sharing or a torrent website. Of course, the first symptom that this browser hijacker has sneaked onto the computer is hohosearch.com set in the place of your preferred homepage; however, you will also see, if you are a more experienced computer user, the folder whose name consists of random letters, e.g. Phenuther, Ploftdrewother, or Wohegh in %PROGRAMFILES% (%PROGRAMFILES(x86)%). Browser hijackers are sneaky infections, so it is not a piece of cake to protect the system from them. Security specialists at pcthreat.com say that users should, first of all, install security software on their computers. Secondly, they need to download programs from websites that are really trustworthy ONLY in the future. Third, specialists suggest staying away from third-party links and advertisements that are rather suspicious. If you keep in mind and do what we say, malicious software should not enter your system again. Theoretically, Hohosearch should disappear after you remove it through Control Panel and reset browsers; however, researchers say that you might also need to set another profile in Mozilla Firefox. Users who have no idea how to do that should not worry because instructions provided below the article will help them. If not, you can use an automatic malware remover, e.g. SpyHunter to eliminate Hohosearch from your computer completely. This security tool will also ensure the system’s safety for you if you keep it enabled. Right-click on the unwanted program and Uninstall it. Find the undesirable software and right-click on it. Close your browser and then launch RUN (Win+R). Type firefox.exe –P in the box. Click OK. Select the default profile from the list and then mark Use the selected profile without asking at startup. Click on the Start Firefox button. Quick & tested solution for Hohosearch removal.